Programs and services for Aboriginal students and communities are located all across the Vancouver campus, and units such as MOA (Museum of Anthropology) are showcases for Aboriginal culture. The First Nations Longhouse, however, is unique as a central hub for programming and services for Aboriginal students, the university, and the wider community. The Longhouse opened in 1993 and is a prize-winning building that reflects the architectural traditions of the Northwest Coast and operates as a venue for public programming, student and program meetings, and many other functions. It is also a centre for Aboriginal students with study and social spaces, a computer lab, and access to tutoring, counselling, and many other forms of support, including the expert research help available at the adjacent Xwi7xwa Library. The Longhouse also houses the Indigenous Teacher Education Program (NITEP), the First Nations House of Learning (FNHL), and hosts a range of student organizations. Read about the Longhouse anniversary celebration (with video). If you are not familiar with campus, click here for directions and a map. When not used by UBC Indigenous programs, the Longhouse’s Sty-Wet-Tan Great Hall is available for rent. For rental information, visit the Longhouse Rentals page. 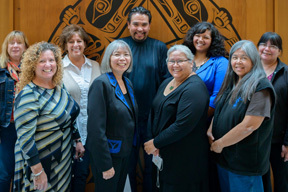 The First Nations House of Learning organizes and provides Longhouse student services and communications; oversees public programming and use of the Longhouse; provides a point of contact for liaising with Aboriginal communities; and leads strategic planning on UBC Aboriginal initiatives. Xwi7xwa Library, located at the eastern end of the Longhouse, is designed to reflect a traditional pit-house, the architectural style of interior First Nations communities. 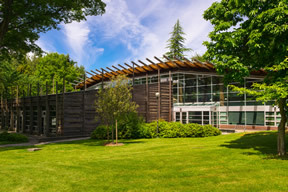 Xwi7xwa is a branch of the UBC Main Library and the only dedicated Indigenous university library in Canada. It houses special collections not found elsewhere and most significantly, it offers students and researchers expert help in conducting research on Indigenous topics. The Longhouse houses the administrative offices of NITEP, a Bachelor of Education program preparing persons of Aboriginal ancestry to be educators. Presently, there is a shortage of Aboriginal teachers in BC, while an increasing number of Aboriginal people desire to become teachers. The purpose of the program is to build upon and strengthen the cultural heritage and identity of professionals in training.